There are so many blog posts floating around the blogosphere recommending this app or that app that often it's hard to determine which apps are worthwhile getting, and which apps are just being promoted by the app creators. The other killer is that there are so many apps that are similar to one another that it makes it even harder to get something worthwhile at all. As teachers, we're far too busy to sit down and try out app after app until we find one that does the job... we also don't have the time to learn how to use the app... only to then teach students how to use the app too. So to help ease the world of apps a little allow me to share with you the top 5 PE apps I have used in class and therefore know work well! 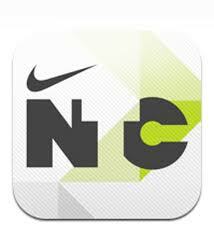 This is a killer app! 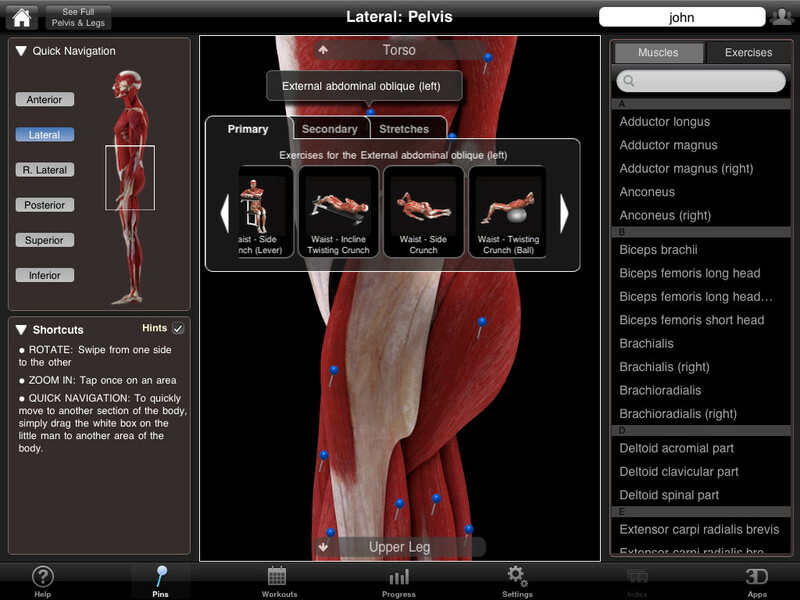 Forget your Anatomy textbook... this app smashes it out of the ballpark! 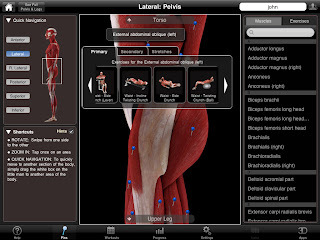 It can be used as a standard "okay let's look at the muscles in the leg" tap on and read the label/name of the muscle... or it can be used as a powerful resource that demonstrates complete with moving clips how to exercise each muscle. So whether you want to use it to explain muscle movements (flexion/extension) or you want to show your star athlete's why they are doing the exercise that you just prescribed to them... you just know visually this app just makes sense. Professionals in the medical fields are loving this alternative way to demonstrate things to their clients too by the way. This little app is simplistic in design and functionality. 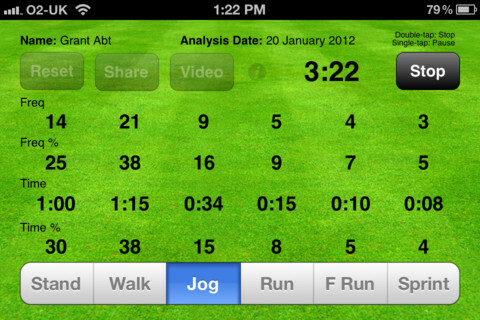 The app is used simply to record how long a player spends doing the following: Running, jogging, sprinting, walking, standing etc. Have students monitor someone in their class as they participate in a game. All they need to do is tap whatever is occurring as it occurs. When the game ends they hit "Stop" and ta-da! an instant break down of how long their player spent doing each movement type. They can record the data and discussion can then take place on the value of knowing how hard players work in a team environment. Want to punish your students? Want to make them work out but allow them to select their own say 15 minute work out? Then this app is fantastic! But be warned for those who aren't involved in regular moderate to vigorous exercise the workout can prove to be brutal. The great thing about this app is the majority of exercises to be completed in any workout require minimal to no equipment. You can preview the list of exercises in the list prior to engaging in it to allow injuries or weak spots to be protected or targeted. You can select how long the workout will go for and the best thing is each exercise comes with an instructional video demonstrating the exercise. Students love the freedom of selecting what they want to work on, they can even play music with the app to keep them motivated as it counts down the time left. Apps like this one are great discussion tools too in regards to whether they really are beneficial for people wanting to build on fitness, the risk of uninformed people using the wrong apps in the pursuit of weight loss and dealing with body/self-esteem issues is a worthwhile conversation to have. This app is brilliant when it comes to looking at health related issues on a global scale. Information is updated and relates of course to the AIDS epidemic including life expectancy, risk of infection rate even education regarding AIDS. Just tap on the country of interest to find the facts and figures. Have students compare countries/continents. Great way to create discussion and debates can result with great use of factual information. This is the best app I have in my bag of tricks and it's best when it comes to picking who gets to go first, who starts with the ball, who gets to be captain, who gets to start on the bench and so on. This app beats flipping a coin because it allows for you to incorporate more than 2 teams in the picking. I often have my class split into three teams with one team resting on the bench/umpiring/scoring whilst the other two teams play (great strategy when you have too many players for games like basketball, netball, handball and indoor soccer). All teams select a captain who then meets me with my iPad on the court. I ask all three captains to place one finger on the black section of the screen and I hit "Pick Finger" The app then randomly picks one of the fingers to highlight. The captain belonging to that finger can then inform their team they're on the bench first. So there you have it! These are by far my favourite apps at the moment as they're easy to use and act as the perfect tools without becoming cumbersome... and the best thing... you don't need to "learn how to use the app". 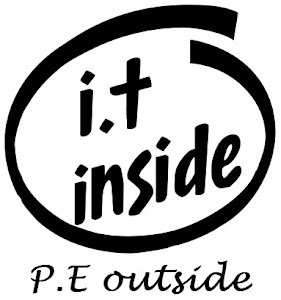 Keep checking back, subscribe and tell your PE friends I'm planning to keep the ball rolling on this bad boy of a blog!